As a Certified Tile Installer, I offer lifetime manufacturer and workmanship warranties on all tile installations, protecting you from shower leaks and cracked tile or grout. Turn Your Bathroom Into A Retreat with a Custom Tile Shower! It's time to bring your bathroom into the 21st century. Everything around us is designed to make our lives easier, yet most bathrooms don't do that. If you are upgrading your bathroom, let's make it a place of escape. Aromatherapy, music and lighting are easy ways to transform your bathroom into a relaxing bliss. Melt your cares away with a custom tile shower. Add body sprays to target specific areas of your body for the ultimate massage experience. We can even integrate your shower with bluetooth speakers so you can jam out while you shower, or listen to relaxing waves crashing on the beach while you steam. Don't trust just anyone to build the bathroom of your dreams. Did you know that your shower will see more water than your roof will (30 times more per year per person)? Hiring a qualified tile installer is extremely important. Even if you don't hire us, we're here to help make your remodeling project a success. A custom tile shower is too expensive to get wrong. Contact us with any questions or concerns you have, we want to help you any way we can. Heating a tile floor is a great way to keep your feet warm. When your feet are toasty, your body just feels better. Our heated floors feature WiFi touchscreen programmable thermostats, you can control the floor from any room in your home. If your shower has a bench, consider heating the bench as well. Your feet won't be the only thing thanking you for that. Our heated floors also feature a 15 year full replacement manufacturer warranty, the best warranty in the industry. For as long as you own your home, you will never have to worry about a leaky tile shower . Installing a recessed niche in your custom tile shower greatly improves it's function. You can have everything you need at an arms length without bending over. A niche can be a focal point in the shower, or hidden out of sight, the choice is up to you. Consider using an accent tile in the back of the niche to give it depth. Niches can also have shelves, and we have installed many showers with more than one niche as well. We custom make your niche to fit the tile layout best. When the niche falls perfectly in an installation it's very pleasing to the eye. As a Certified Tile Installer I take education seriously - Keeping up with correct installation methods, techniques and skill helps me improve my craft and give you a better installation. Direct water to the exact location you desire. For the best shower experience have multiple shower heads installed in your shower. Multiple shower heads allow you more control of your shower experience. A handheld shower head gives you additional freedom as well. A truly unique experience is the use of a waterfall shower head, instead of your typical shower head. The waterfall is a great addition to any shower and makes for a great shoulder massage as well. ​To truly bring your bathroom into this century, a smart shower is the way to go. Using a smart shower is very similar to using your smart phone. Touch screen controls allow you to select the shower function you want to use. You can also control music, lighting and steam as well. You can even have two temperatures at the same time all from one controller. The perfect solution for a shower built for two. Perhaps one of the best features of a smart shower is the elimination of all the handles and controls. With the push of a button you can select which function you want to turn on or off, in any combination you choose. A steam shower addition is an easy way to improve your overall health. A 20 minute steam reduces stress, improves circulation and tightens skin making you look younger. All these great health benefits for about 2 gallons of water, so it's good for the environment as well. A simple touch of the screen starts your steam shower flowing. Unlike a jetted tub that takes forever to fill up, your steam shower will start delivering steam in less than a minute. Take your steam to the next level with waves crashing on the beach, or the gentle sounds of a rainstorm. Do you use essential oils? A steam shower is another diffuser for your oils, add aromatherapy to your steam to unwind from the day. You can use your own imagination for which oils you look forward to using the most. The steam is so thick you can't see into the shower. As any custom tile shower specialist will tell you, it's good to dream big. Dreaming big helps you prioritize your tile shower budget. When we meet for your consultation I try to go over as many different options with you as possible. You are likely to only install a custom tile shower once in your lifetime, now is the time to get what you want. Properly installed tile will last a lifetime, and that's why you need a tile installer that knows what properly looks like. Tile is only as good as its foundation, if the substrate is wrong the tile won't last. These side by side body sprays can be directed at your upper or lower body. ​The stacked double niche is great for storing your shower necessities. The narrow shower curb is easy to step over and adds valuable space inside the shower. The raised shower head is comfortable for you to stand under and provides you a great experience. 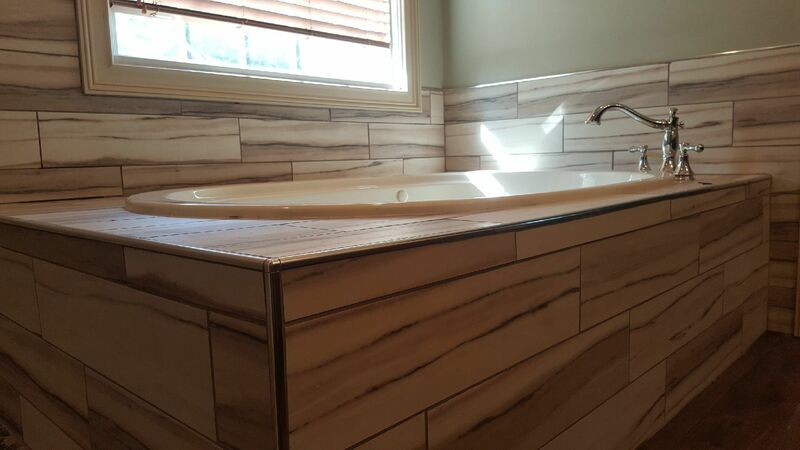 If your tub deck is larger the glass panel can be located to make part of the deck into a shower bench. This shower includes a lifetime manufacturer warranty protecting you against leaks. Eric is excellent at what he does and has the time to explain things very clearly and carefully to his clients. We were so pleased to have worked with him. We are new to the area and contacted 8 different contractors for estimates. 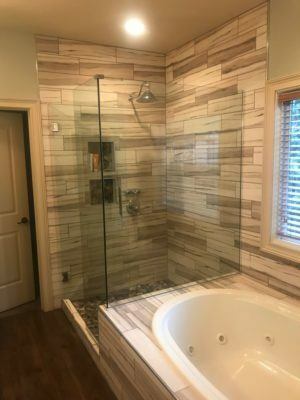 Eric was by far the most frank about possible issues and also clearly was very knowledgeable about both tile and wood products and the possible challenges of installation. His price was very fair. As others have stated he's also a really nice person. I recommend him very highly and would certainly go to him directly for any future job. I don't think anyone would be disappointed in hiring him. Eric was very easy to work with, because of some health concerns on our part, we had to reschedule several times. He always worked with us on this issue. Did an excellent job on redoing the shower. The tile is well done & looks beautiful. I am very pleased with the entire job & experience. Would definitely use him again & would recommend to friends and family. Also, he is very ethical and trustworthy. This was a huge project and we are so glad we chose Eric to do it. We could trust Eric to be in our home or when either of our teenage daughters were home alone. Eric is dependable and does what he promises he will do. He is kind and pleasant to be around - very nice since we spent so much time together during this project. He was reliable to give us a time frame to work with - especially since we did some of the demolition ourselves. We did not tear up too much ahead of time, nor did we feel rushed to at the last minute to get our part done. Eric was also helpful to give us tips on the parts we were doing ourselves. He uses quality materials and knows how to use them properly. For anyone who thinks his estimates are high, you should compare apples to apples and know that you get what you pay for. The Schluter products he uses are well known to be superior products. If you use them, you will not be redoing your project because of failure - only if you get tired of it and want something different. Eric stands behind his estimate and that is what you will pay for the job (unless, like us, you keep adding to it as you go along). A curbless tile shower provides the ultimate in ease of accessibility. I love the clean lines and zero entry aspect of these showers. I think one of the biggest benefits is having an accessible shower that doesn't look like one. These shower pans are recessed into the floor of your home, making the shower drain the lowest part of the floor. As with all our tile showers, we still provide a lifetime manufacturer warranty protecting you against leaks. How Much Does A Ceramic Tile Shower Installation Cost? The cost of a custom tile shower varies greatly depending on many factors. Obviously the more features your porcelain tile shower has, the greater the cost will be. Generically speaking, our average shower cost is about $5,000 for tile, labor and materials. More involved bathroom tile designs will likely increase the overall cost (both in labor and materials). This cost also includes our dust protection service for your home as well as a whole house cleaning service once your job is finished. Our tiled showers are built with the best waterproofing materials on the market. We don't use outdated cement board for our shower walls, instead we use a lightweight waterproof board. It's important that the waterproofing material be fully installed from the shower head, all the way to the drain. All horizontal surfaces in your shower will also have a slope towards the drain. Horizontal surfaces include benches, niche shelves and the shower curb. Having a sloped surface eliminates standing water and will allow the shower to dry completely in a short amount of time. A fast drying shower eliminates mold and mildew growth.